Does John Piper watch the Teletubbies? Years ago when my two oldest kids (we have four) were still toddlers, one of their favorite TV shows was the Teletubbies. At first, I found this show as annoying, creepy and nonsensical as most parents do. But after a while, it actually began to grow on me, to the point where I preferred it over many of the other annoying shows they enjoyed. One thing I liked about the Teletubbies was their interaction with the narrator of the show. Sometimes he’d open the episode by saying, “One day in Teletubby Land, all the Teletubbies were very, very happy.” In response, the Teletubbies would spring to their feet, and say, “Yes, yes, very happy!” Then they would launch into a flurry of activities to demonstrate just how happy they were. 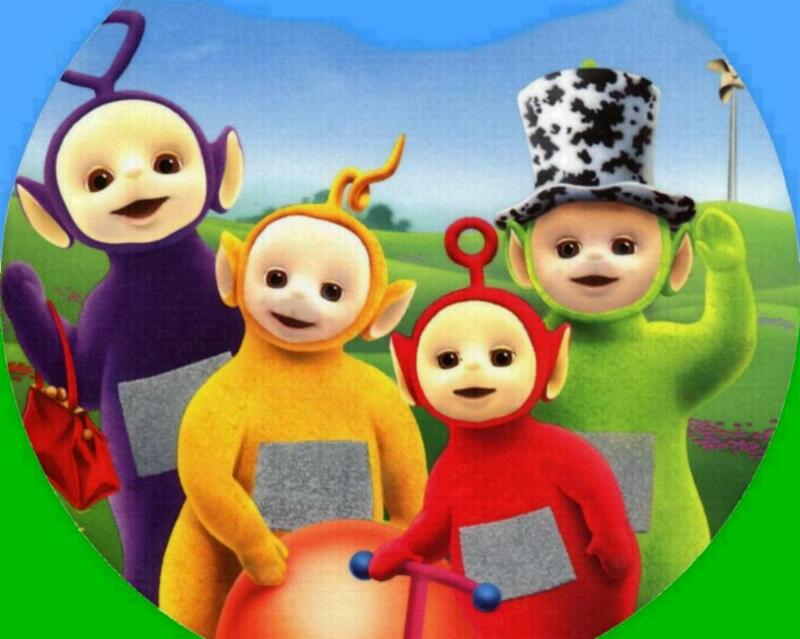 Laa-Laa would bounce her ball, Po would ride her scooter, Dipsy would tip his hat, and Tinky-Winky would swing his infamous bag. Which brings me to John Piper. Yes, I follow him on Twitter. Partly because I’m a masochist, but mostly because he figured so prominently into the condemnation of Rob Bell with his famous words of farewell. Hmm… I thought to myself. That sounds a little self-centered, doesn’t it? I thought the real battle in life was to curb my selfish jerk impulses by making it my goal each day to to love God with all my heart, mind, soul and strength and to love my neighbor as myself. Which brings me back to the Teletubbies. I think this is how John Piper imagines God to be–like my imaginary version of the Teletubbies narrator. He’s standing off camera with a gun. And when he says, “One day on earth, the Christians were very, very happy,” Christians like Piper leap up and say, “Yes, yes, very happy!” And then they set about demonstrating just how happy they are. But it’s an annoying kind of happiness. Nonsensical too. Unlike the Teletubbies, Christians actually do take pleasure in God wholeheartedly, not halfheartedly and artificially. John Piper talks about joy and satisfaction in God in much more depth in his book Desiring God. It is truly a pleasure (ha) to read. In regards to the line about God threatening terrible things to those who will not be happy in him, Piper wrote a little something in a past Table Talk explaining a bit of Psalm 2. I think Piper would argue that joy is commanded by God; that when “rejoice” appears in Psalm 2: 11 and when “delight” appears in Psalm 37: 4, they are in the imperative and therefore must be obeyed. If that is true, then if we do not rejoice with trembling or delight ourselves in the Lord, we are in big trouble. Good thing that, upon regeneration, God puts in us a heart that rejoices in God. Otherwise, it would be impossible to take refuge in Him. Soli Deo Gloria. Wow! Yeah, that’s just creepy. IMO when God says “Rejoice!” that’s an empowerment, an encouragement and exhortation, and a blessing — not a threat. Agreed Kevin. Reminds me when Piper said if God reprobated one [all] of his children, he would rejoice. Links or it never happened. I’m curious to see/read/watch/listen to that. I don’t understand. What are you curious to see/read/watch/listen to? A link of him saying that if God reprobated one [all] of his children, he would rejoice. There are times where I have to eat a bit plate of Crow and this is one of them. In the article of the reformed Journal, Piper does not say that and I have to retract my words. Piper simply says that he would not rail against God if God did reprobate them. But while that is different than rejoicing at their reprobation, I can see why I interpreted his words as such – for what is a Calvinist to do, not rejoice in the reprobation of the damned? Why would they not? Why would Piper not ONLY bow his knee, but also rejoice in God’s decision to reprobate his evil children? So on one hand that I retract the words, I see it as an tantamount to the Calvinist position. He rejoices in whatever God does because God’s got the gun.